If you are among those that count themselves fans of the Chinese marital arts action genre, you probably know the name Yuen Woo-ping. Since 1978 he has been making action movies in China and Hong Kong beginning with Snake in the Eagle’s Shadow, and Drunken Master, two of Jackie Chan’s earliest films. Over the years, Yeun has worked with the best of Chinese martial arts cinema, as well as some of the biggest names in Hollywood. 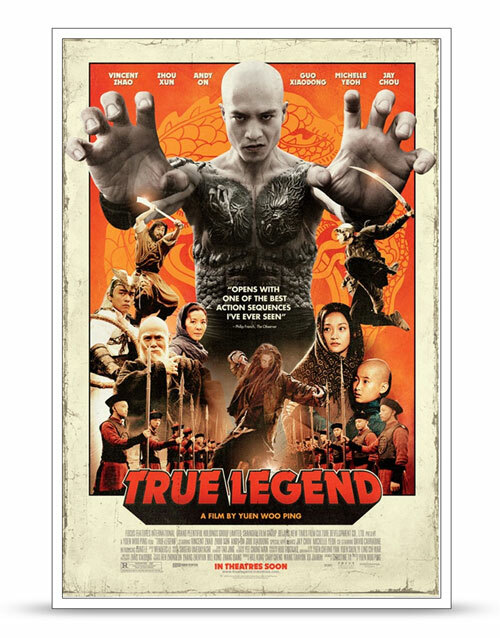 Perhaps best known in America for his action choreography in the Matrix trilogy and both Kill Bill films, Yuen returns to his directorial roots for the first time since 1996 with True Legend (aka True Legend of Begger Su), a film that has some spectacular fight sequences. It also has some bizarre plot moments, and is essentially two movies that are only loosely related to each other and just happen to feature the same characters. The film debuted in China in both 2D and 3D, and was sold as the first Chinese 3D film. It then went on to be considered one of the biggest commercial disappointments of the year, and hopes to recoup its losses stateside. There is no denying that Yuen has an excellent eye for visual action scenes – he is among the best working today – but when it comes to pacing and narrative, there are a few issues. Nothing that should stop fans of the genre from seeing the film, but it will hurt the mainstream appeal towards people that aren’t into martial arts films in general, but are looking for something more akin to Crouching Tiger and Hidden Dragon (which Yuen also choreographed). Two movies for the price of one! In the early years of foreign expansion into China, Su Can (Vincent Zhao) is a general in the army of an unnamed prince. When he risks all to rescue the prince from a group of mountain bandits, he is then offered the governorship of a prosperous region. Su declines in order to return to his wife Ying (Zhou Zun) and to open a martial arts school, but recommends his step-brother and brother-in-law, Yuan (Andy On). Despite the prince’s misgivings towards the envious and hot-tempered Yuan, he accedes to Su’s wishes, and after a friendly goodbye, Su returns home. Five years later Yuan, now governor, is on his way to visit Su and his father, who it is revealed was forced to kill Yuan’s father after a forbidden form of martial arts called the Five Venom Fists technique drove him mad. When he arrives, it is obvious that Yuan has changed, both physically and mentally. He kills Su’s father and kidnaps his sister Ying, as well as Feng, Ying and Su’s child. Su arrives and he and Yuan fight. 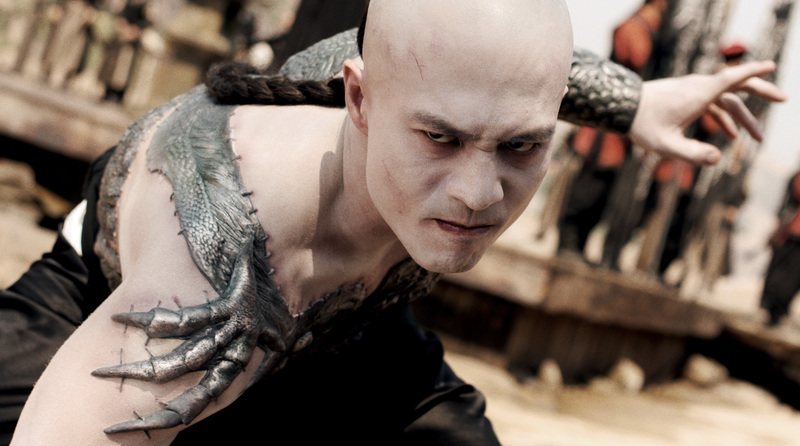 But besides just learning the Five Venom Fists technique that his father practices, Yuan also sewed metal sheets into his skin to act as permanent armor. He defeats Su and throws him in the nearby rapids. In the hopes of saving him, Ying jumps in after them. This is all done in the first 20 minutes or so, and is fairly traditional martial arts storytelling. Former friends become enemies, a supernatural fighting style is revealed and the hero is defeated and must learn something before returning. Following the fight, Su is broken, and while his body heals, he needs to heal his mind as well. This is where the movie gets weird—well, weirder than a guy sewing metal planks into his skin. Su is sitting in bed one day after weeks of heavy drinking and self-loathing, and he literally jumps up and decides to train to rescue his kid. He heads out into the woods and meets the God of Wushu (Jay Chou), and a wizened old sage sporting some boss eyebrows. The God trains Su, but it turns out Su may or not be crazy and is imagining the whole thing. Ying leaves to save Feng, and Su follows, leading to a climactic battle with Yuen. And that is the just the first half of the movie. After the events of the fight, an almost entirely different movie begins. The consequences of the battle have left their mark on Su, and he becomes a drunk. While on a bender, he meets the Drunken God (also Jay Chou) who teaches him drunken boxing. Su is then forced to fight foreigners controlled by Anton (David Carradine in one of his final roles) to defend the honor of China. Either one of the two plots would be entertaining and make for a good movie, but together it feels like a bit of a sucker punch to have one story be the focus, then suddenly change drastically in both plot and tone; it’s a bit disjointed. Once the battle with Yuan concludes, it really is like a different movie. There are a few of the same characters, but not many. It is odd, but then again, the whole movie is odd. That isn’t necessarily a bad thing, but it won’t win over fans looking for a deep, epic Chinese tale. There’s a part about fighting a guy with metal for skin, then a part with a drunk beating on giant dudes. Plot is a secondary concern for the film. When it comes to Chinese martial arts movies, plot is usually just a justification for people beating on each other in spectacular ways. Sure, it’s nice to have a compelling tale, but it really isn’t much different than American comedies where the humor is far more important than the usually unbelievable plot. The movie begins immediately with one of the best action scenes in the film. It’s all out battle using wires, trick photography, and exceptional choreography. It is an impressive scene, and one of the best action scenes of the last few years. From there though, there are really only three more fight scenes, plus two interesting training sequences. For Yuen, the master of fighting choreography, it’s a bit skimpy. But what there is, is very good. It is an odd balance, and this is where True Legend stumbles a bit. The movie wants you to buy into the plot, as the action scenes are all building to the important and climatic battles. Every scene between the fights is built around the emotional ideals of the movie. The second part of the film especially, has several emotionally charged scenes that border on melodramatic, which is fairly common in Chinese martial arts movies. Sometimes they work, sometimes they don’t. But the plot is hard to care about because it changes so suddenly and so drastically. The lack of action scenes then stand out and becomes notably absent as you are forced to follow a plot you aren’t invested in. That doesn’t make it bad, it just drops it in an odd no man’s land—it’s not all action, but neither is it a drama. It is a bit of both, but doesn’t excel in either. True Legend is a film with a bit of greatness, a bit of foolishness and a ton of weirdness. It’s so out there that it never becomes dull, but the plot never really takes hold because it jumps around and there are only a handful of fight scenes compared to many other martial arts movies. It’s like the movie is never entirely sure what it wants to be. Sometimes it wants the epic flair of a movie like House of Flying Daggers or Curse of the Golden Flower, but it has a sense of humor about itself that knocks it out of those comparisons. On the flip side, it doesn’t have the same frantic fighting energy that Yuen’s older movies like Tai Chi Boxer 2 and Iron Monkey have – but it’s still entertaining. It isn’t the best example of Chinese martial arts action cinema out there, but the first and last fight scenes alone almost make it worth watching. True Legend isn’t a movie that will win over people that don’t already like the style, but it should entertain fans of the genre and of Yuen.